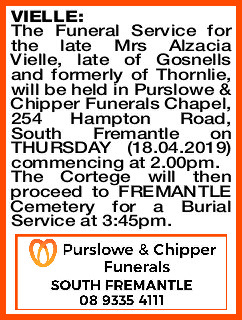 The Funeral Service for the late Mrs Alzacia Vielle, late of Gosnells and formerly of Thornlie, will be held in Purslowe & Chipper Funerals Chapel, 254 Hampton Road, South Fremantle on THURSDAY (18.04.2019) commencing at 2.00pm. The Cortege will then proceed to FREMANTLE Cemetery for a Burial Service at 3:45pm. Sorry I couldn't get to your mothers funeral today Jack. Deepest sympathy to you and your family. Sending our love and condolences to the Vielle family and extended family. Love Jean-Marc, Rita Gresle and family. Melbourne, Vic.